Dump truck varieties vary by use and by state. There are general purpose trucks, job, and material specific trucks as well. Each state has its own rules and regulations that will affect the type of truck best suited for your application. We will explain some of these variables below, but please feel free to contact us. This is a dump truck with a lift axle behind the drive axles, it can be a non-steerable or steerable axle. Makes for tighter trailer maneuvering. Truck needs an extra-long wheel base to properly balance weight. Lift Axle can create ground clearance issues; the bigger the tire, the bigger the problem. All information below is not guaranteed to be accurate. ALWAYS contact your local enforcement agency to assure compliance. Alabama Department of Transportation legal code; Computed Gross Weight Table begins on page 4. Arizona Administrative Code, Department of Transportation Commercial Programs. Arizona bridge weight restrictions for state highways. Size and Weight Laws for the state of Arkansas. All trucks with loads that can be broken down have an 80,000lbs max weight limit. Tire weight capacities are based on manufacture rating, no tread width restrictions. Colorado State transport rules and regulations. Download the Colorado FYI Flyer with state specific bridge weight formula on page 3. Connecticut Bridge Formula can be found here. Delaware state trucking regulations can be found in this policy and procedurals manual. Click here for the Florida State Trucking Manual. Georgia state trucking regulations can be found here. Be sure to click on "Legal Maximum Weight Limitations" to get all the necessary details. The department of transportation for the state of Hawaii can be found at this link. Review administrative rules 101, 104, and 106 for pertinent information regarding trucking in Hawaii. Maximum Legal Dimensions and Weights for Illinois can be found here. Reference pages 18-25 of the Iowa Truck Information Guide for relevant trucking information. Kansas state trucking handbook; helpful information begins on page 24 with reference tables on pages 30-34. Most trucks are limited to 80,000 pounds, but Kentucky allows coal trucks to carry up to 126,000 pounds, or 23 tons more than the others. Review the legal code here. The Louisiana State Department of Transportation guidelines for Trucks, Vehicles, and Loads can be found here. Maine Commercial Vehicle Laws & Regulations can be found here. Please reference pages 14-20 for weight limit restrictions. Here is the link to the State of Maryland Bride Table, you can find the table on page 89. Click here for the Massachusetts state Commercial Motor Vehicle Information guide. Maximum Gross vehicle weight is 164,000 lbs. Maximum number of axles is 11. Michigan has a tread width weight restriction of 700 lbs per inch. Maximum Gross vehicle weight is 108,000lbs. with 8 axles. Information for weight limits and permitting for the state of Mississippi can be found here. Click here to access a pamphlet detailing size and weight limitations for the state of Missouri. The Montana Commercial Vehicle Size, Weight and Safety handbook can be found here. A quick reference for Nebraska legal size and weight limits can be found at this link; a more detailed reference guide is available here. Gross Maximum Load Limit for vehicle combinations of 9 or more axles is 129,000 lbs. Maximum load Limit on any single axle is 20,000 lbs. and on any tandem axles is 34,000 lbs. Two axles with centers not more than 96 inches apart are considered tandem. In addition, the maximum weight per inch of tire width is 600 lbs. on the steering axle(s) and 500 lbs. on all other axles. a list of bridge review triggers is available via this link. General information regarding trucking in New Jersey can be accessed through this link. To download the New Mexico Truckers Guide, just click here. New York State Legal Dimensions, Weights & Gross Weights are available by following this link. Vehicle weights and loads are available in this section of the North Carolina legal code. The North Dakota Load Restrictions Chart can be found here. Click here for the Legal Dimension and Weight Limits for Highway Vehicles in the state of Ohio. Click here to view Oklahoma state size, weight and load information. Maximum weight allowed on loads that can be broken down when using Extended Weight Highway Variance Permit is 105,500 lbs on interstate highways. The Oregon State Department of Transportation Motor Carrier Education Manual, including load limitations is available here. Oregon DOT bridge formula click here. Click here for a quick reference guide to height and weight restrictions for the state of Pennsylvania; the full legal code is located here. The State of Rhode Island has published a Manual with information pertaining to overweight and oversize vehicle permits. South Carolina has published a set of guidelines for oversize and overweight vehicle loads; gross Weight information begins on page 6. 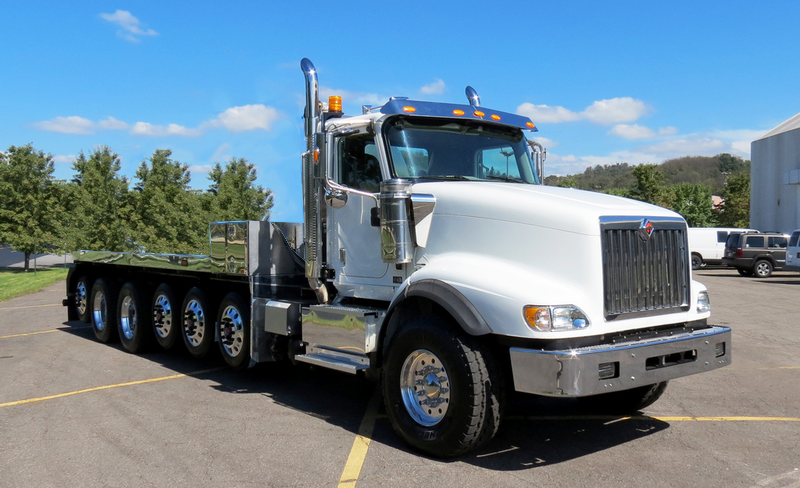 Click here for South Dakota truck size and weight configurations. The Tennessee state motor carrier manual, including the weight and load limitations, is available here. The Trucking Guide for the state of Utah is available for download via this link. Vermont's Guide for motor carrier safety regulations is available for download. Virginia Size, Weight and Equipment Requirements are available here. Please click here for the Washington State Commercial Vehicle Guide. West Virginia Legal Limits information is available for download as a word document here. Wyoming state trucking weight limitations are available via this link.